Several storage companies in the Bronx will simply take your money and forget about your property. Moishe’s Self Storage is one of the few storage companies in the Bronx that doesn’t disrespect our customers. We believe the standards of storage companies throughout New York City should be raised in many facets, and customer service is just one of them. We’ve long strived to be regarded with the reviews and trust that we’ve gained, and just because Moishe’s is one of the storage companies in the Bronx that people like, we’re not stopping now. The Bronx has a wide variety of storage needs, so there’s noticeable room for many facilities. These facilities have found their niche and deliver types of storage to customers that need quick fixes. 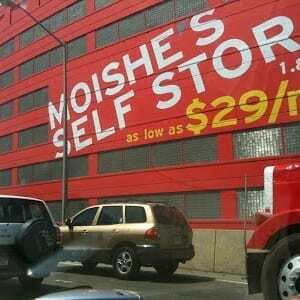 Moishe’s is one of the storage companies in the Bronx that fills many niches other than one. We’ve done this by allowing our facility to grow towards what the customers are asking for. We wanted to create a storage facility that served all of New York City other than a select few. Stop worrying about getting ripped off the by the other companies in the Bronx, and start renting with Moishe’s Self Storage today. You’ll find a wealth of information on our site about storage rooms, but if you need to contact a storage advisor it’s easy to do so. Call (800) 536-6564 or click here to find out which storage facility is right for you. End your search for self storage near me, and start renting Moishe’s!